Creating UML statechart diagram with free templates and examples. UML statechart diagram has never been easier. UML statechart diagram, also known as UML state machine, defines different states of an object during its lifetime. A statechart models the dynamic flow of control from state to state within a system. UML statechart diagrams are used to forward and reverse engineering of a system and the main purpose is to model reactive system. The term "UML statechart" can refer to two kinds of state machines: behavioral statechart diagram and protocol statechart diagram. 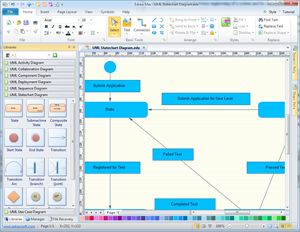 Behavioral statechart diagrams can be used to model the behavior of individual entities. Protocol statechart diagrams are used to express usage protocols and can be used to specify the legal usage scenarios of classifiers, interfaces, and ports. Edraw offers an easy way to create UML Statechart Diagram to define different states of an object in its life circle. Open the UML Statechart diagram template, you will find related symbols and shapes. Simply drag and drop the shapes you need to your page, and use Edraw smart connectors to illustrate the relations between them. Edraw tries its best to provide the most simple-to-use drawing method, which enables everyone to draw freely, no matter you are experienced or occasional users. It's not only convenient, but also time-saving. Edraw software offers you plenty of special shapes and symbols used in the UML state chart, state, submachine, composite state, start state, end state, transition, transition Arc, transition (branch), transition (joint), decision, history, constraint, note. 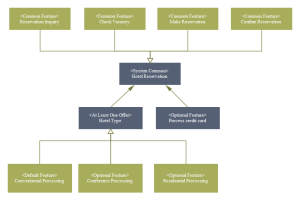 A template of uml diagram about hotel reservation is ready to use in vector format for your own designs.